Interactive Whiteboard / Electronic Whiteboard are an ideal solution for your collaborative needs. They are a large interactive display that comes in the design of a traditional whiteboard which can either be a standalone computer or act as a large functioning touchpad for other computers to use. Coming with a device driver that enables the interactive whiteboards to work as a Human Input Device as well as other noteworthy features such as a digital projector, a handwriting recognition system, software and tools made exclusively for the device, it has an enormous advantage over traditional whiteboards, making it a must have for classrooms and corporate meeting rooms. Improved Communication: With Interactive Whiteboards, the users can easily communicate either wirelessly or through its several connectivity ports. Improved Learning: Through their interactive capabilities, interactive whiteboards assist students in retaining information easily. Effective Classes: Interactive Whiteboards allow more information to be transmitted, resulting in a more efficient and effective class. Increased Participation: With Interactive Whiteboards, students can conveniently participate in the class which leads to greater understanding. Mobile Connectivity: Interactive Whiteboards come with the capability of wirelessly connecting with other devices. Collaborative meetings: Interactive Whiteboards give users the ability to work in collaboration. Participants can edit their files remotely during meetings. Easier Sharing: With its unparalleled sharing capabilities, the users can conveniently share files, notes, annotations, etc. Interactive Whiteboards Are The Perfect Choice for Your School! In schools, the Interactive Whiteboards have completely revolutionized the education environment. Nowadays, students demand a teacher who can stimulate their interest in the topics being thought by initiating group discussions, giving practical examples, and creating an interactive setting. It is a known fact that an interactive session results in a greater retention ability of students and increases their attention span. Interactive Whiteboards for schools are a phenomenal addition to the classroom setup. They allow teachers to effectively conduct their classes and instil more knowledge in a shorter time span. They allow teachers to wirelessly control their device and freely move around to help the students. Electronic Whiteboards also allow multiple users to connect their devices with them to add, annotate, highlight text and perform other similar actions with a simple set of commands. They offer various advantages over traditional whiteboards that make them a must have for any institution. Interactive Whiteboards Will Revolutionize Your Business! In addition to being an advanced and ultra – modern addition for schools, Interactive Whiteboards can also induce a positive change in businesses by allowing effective collaboration and increasing the overall productivity. In contrast to an ordinary LCD screen, the users can make use of the innovative features of electronic whiteboards while presenting their work in corporate meetings. The Interactive Whiteboards allow the participants to give their input by directly annotating the documents and leaving their comments from their handheld devices. Interactive Whiteboards help teachers in conducting effective classes and achieve maximum learning outcomes by creating an engaging and interactive environment for students. With Interactive Whiteboards, students feel more involved in the classrooms and respond with more enthusiasm, resulting in an improved learning experience for them. If you are a teacher, you’ll fall in love with Interactive Whiteboards!!! They incorporate many creative features that will help you in creating a more engaging lesson. For example, many built – in software suites that support learning in an encouraging, confidence building and collaborative setting. Moreover, the Interactive Whiteboard’s adaptability to work with various gadgets enables them to be a helpful addition in your classroom. Capture, Record, Save and Share with Interactive Whiteboards! Perhaps the biggest advantage of using Interactive Whiteboards is their ability to record the proceedings of the classrooms along with the audio. Teachers are free to use online screen recording tools as well, which allows them to instantly share the recorded session over the internet. This feature is extremely useful businesses as well. Imagine missing some key details of the design you discussed with your client in a meeting. You simply can’t complete the task without it and asking the client about it again would seem extremely unprofessional. The recording feature of Interactive Whiteboards can easily save you from this embarrassing situation, simply play the recording and you’ll get back the client’s instruction along with your required design. Interactive Whiteboards are effectively accessible in various sizes and details to make it less demanding for clients to purchase a perfect one for them. They often come with a built-in computer and also come with several connectivity ports such as HDMI, VGA, USB, which allows several types of devices to connect with the electronic whiteboards quite easily. More often than not, they usually come supported with greatly effective speakers that convey the voice in the entire room. Are SmartBoards and Interactive Whiteboards Same? Smartboard is a commonly used term for all Interactive Whiteboards and has become synonymous terms but it actually refers to the Interactive Whiteboards manufactured by Smart Technologies. 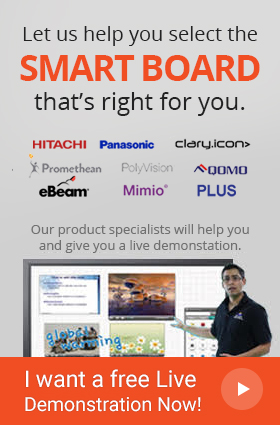 SmartBoard is just one brand. Countless other Interactive Whiteboards by different manufacturers are also available on our website. Why you should get an Interactive Whiteboard. Every single Interactive Whiteboard is designed to ensure the best overall experience for you. Each brand has their own unique set of features which makes them ideal for different application. We offer Interactive Whiteboards from all the major manufacturers in the market and we provide complete descriptions of each product available on the website in order to help you make an informed decision. Interactive Whiteboards have slowly become a necessity for any setting that requires extensive use of written communication. Apart from various benefits of choosing electronic whiteboards, for both educational institutes and businesses, discussed above, they are also quite attractive and have the ability of increasing the professional look of any room they are placed in. Users do not need to maintain a regular supply of board markers because a majority of interactive whiteboards work equally well with any solid object. To conclude, time has made traditional whiteboards obsolete, opting for electronic whiteboards is the next logical step and its implementation has become inevitable.